Attorneys are rarely held personally responsible for the unethical or illegal decisions of their clients, even if the attorneys arguably help to carry out that unethical conduct. It is a very rare occasion when an attorney is held responsible financially or criminally for the acts of their clients. In a ruling that has come as a surprise to employment defense attorneys, the Ninth Circuit Court of Appeals has decided to hold an employer’s attorney financially liable for retaliation against an employee who sued his employer. The plaintiff in the case titled Arias v. Raimondo, José Arias, had worked as a milker at Angelo Dairy since 1995. When he was hired, he did not fill out an I-9 form, required to establish that a new hire is legally permitted to work in the US. Arias was not in the US legally, and the Angelos were aware of this fact. On at least one prior occasion, the Angelos had threatened Arias that they would notify Immigration and Customs Enforcement (ICE) if he left his job with the dairy for one that offered higher pay. In 2006, Arias filed a claim against Angelo Dairy in California state court, claiming that the dairy failed to issue meal or rest breaks or pay overtime as required under the law. The Angelos’ attorney, Anthony Raimondo, devised a plan to retaliate against Arias for filing this claim against the Angelos. Arias presented emails to the Ninth Circuit showing that Raimondo contacted a local ICE official to notify her of Arias’ illegal status, and to coordinate with agents to have them detain Arias when he appeared for a deposition. Raimondo used this fact to coerce Arias to dismiss his claims against the dairy. Raimondo admitted that he had contacted ICE agents to recommend the deportation of the dairy’s undocumented workers on numerous occasions. In May of 2013, Arias filed a lawsuit in federal court claiming that the Angelos and Raimondo had retaliated against Arias in violation of the Fair Labor Standards Act (FLSA). Arias argued that the law prohibits “any person” from retaliating against an employee who has filed a complaint against their employer, and that the law specifically included “legal representative” in its definition of the term “person.” Thus, Arias argued, a court could find Raimondo financially liable for retaliating against Arias in the form of arranging for his potential detention and deportation by ICE as punishment for suing his employer. The trial court dismissed Arias’ lawsuit, ruling that, since Raimondo didn’t have control over Arias’ employment, he could not be held responsible for retaliation. The Ninth Circuit disagreed. The Ninth Circuit opinion noted that, while some parts of the law banned conduct by an “employer,” the retaliation section banned the conduct by “any person acting directly or indirectly in the interest of an employer in relation to an employee.” Since Raimondo was the agent of the Angelos when he attempted to have Arias deported, he could be sued for retaliation and potentially required to pay fines as required by the FLSA. 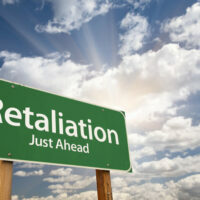 If you’ve been the victim of retaliation in the workplace or are an employer seeking guidance about your rights under California employment law, contact the effective and knowledgeable Bay Area employment lawyers Richard Koss and Rand Stephens for a consultation in Antioch at 925-757-1700, or in Redwood at 650-722-7046.